All transactions are safe and secure with a reliable history in online purchasing behind each of our associates. Buy the When I'm Sad, I Stop Being Sad And Be Awesome Instead t-shirt to own How I Met Your Mother clothing and merchandise. This bestselling HIMYM tee features the classic Barney Stinson How I Met Your Mother quote, "When I'm sad, I stop being sad and be awesome instead." It ranks up there with other Barney quotes like, "Suit up because tonight will be legendary." Beside the quote are two depictions of a cloud, one with a sad face and one with an awesome face. Pair it with the Barney Stinson Suit Up design that is also available on a variety of merchandise styles, including ringer Ts. Wear the Suit Up t-shirt when you're feeling formal and this one when you're feeling awesome. 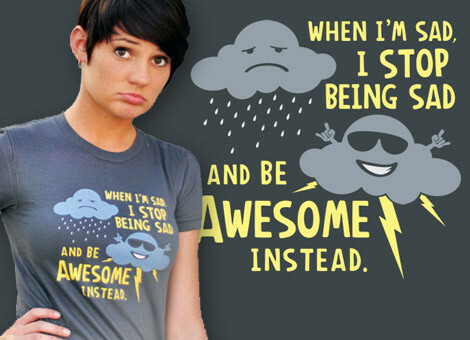 In addition to the When I'm Sad, I Stop Being Sad And Be Awesome Instead tee above, browse the How I Met Your Mother Clothing Gallery for more apparel like men's and women's clothes, kids shirts or hoodies.